Arran is a special place with special birds. Birding on Arran is interesting at any time of the year. The Isle of Arran, a wildlife haven, lies in the Firth of Clyde, 28km west of the Ayrshire coast, 5km east of the Kintyre peninsula. For instructions on how to get there follow the link for Travel. Its northern half is rugged, mountainous, remote country, good habitat for Golden Eagle. Goatfell (874m) peaks over the principal town of Brodick on the east coast. The south has gentler moorland, extensive conifer plantations and much of the island’s farmland. Much of the coast is raised beach with a shoreline of rock or shingle, and steep escarpments. The wide diversity of habitat across the island results in a rich bird list of over 250 species. Arran has a healthy population of raptors, notably Buzzard, Kestrel, Sparrowhawk, Hen Harrier, Short-eared Owl, Peregrine and Golden Eagle. Nightjar may be in cleared forest. Red-throated Diver breed on remote hill lochans. As well as raptors, Arran is a nationally important area for Red-breasted Merganser, and, in the autumn, for Black-throated Divers. Great Northern Divers, Red-throated Divers and Black-throated Divers can be seen off the coast most of the year. It is an internationally important area for Hen Harrier, for which there is a Special Protection Area (SPA) of over 11,000 hectares. Arran is rightly described as Scotland in miniature. To get a flavour of the birds around each month click monthly news and to keep up to date with what "unusual" birds are around click recent sightings. 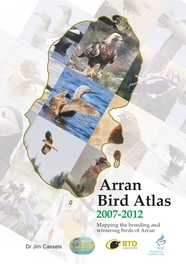 Interested in the birds of Arran? Then these publications are a must for you.